By the end of its third year, Kuhlman Co. will have 58 "small-box" stores in 18 states and Washington, D.C., selling modern clothing and accessories for men and women. A basic information system only connected ten stores and required layers of pasted-up spreadsheets to get financial statistics. Reports were late and inaccurate. Executives tested three name-brand IT systems in-house. Microsoft� Retail Management System with Microsoft Business Solutions�Great Plains� integrated all data and proved easy to use at all levels. Executives make far-reaching decisions on customized reports, ready in minutes. New cash comes in from �charge-and-send� sales, and global customer base. Complex reconciliations once took days but now take hours or minutes. End-of-day closings take �zero� time. Selling 13,000 men�s and women�s clothing and accessory items from a growing chain of 40 stores across the United States had burst the seams of Kuhlman Company�s first information technology solution. Busy store staff and managers were often late reporting their hours, sales, inventory, and requests for transferred merchandise. Business Microvar Inc., a Microsoft� Certified Partner, installed Microsoft Retail Management System and Microsoft Business Solutions�Great Plains�. Today, chain-wide knowledge is immediate. Stores� closing reports are automatic, complete, and available in seconds. Sales and customer data slides into Microsoft Great Plains software, and accounting tasks that were once complex and time-consuming are now finished in minutes with much higher accuracy. Standard and customized reports guide decisions with facts, not guesses. 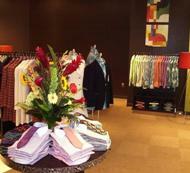 Kuhlman Company, Inc., of Minneapolis, Minnesota, opened its first store in June 2003. Two years later, the company had grown to 34 stores and its stock was trading over the counter. By year end, store count will reach 58 in 18 states and Washington, D.C.
Because Kuhlman stores� �small-box� floor plans encompass 500 to 2,000 square feet, smart merchandising is paramount. Tasks and steps must stay lean. Yet, Kuhlman�s complex overall business model includes purchasing raw and finished goods from United States and European vendors, sewing most items, selling private-label merchandise to other retailers, and a high reliance on in-store inventory. The chain sells more than 13,000 items of �Uniquely tailored Anglo-Italian apparel� of �Uncompromising quality at an uncommon value,� in the words of the company Web site. Stock includes men�s suits, blazers, pants, shirts, and accessories�while dedicating six stores to an equal assortment of women�s fashions and accessories. But tracking receipts, customer records and purchases, inventory levels, transfers, plus hours and commissions for 150 employees, was unraveling the company�s basic information technology (IT) system. Barbara Langdon, Director of Cash Management, describes the layers of complications she dealt with when growth exceeded the capacity of the entry-level system. �Since 90 percent of our business is credit card receipts, I had to reconcile stores� daily bank statements against daily totals from each card, then post these to the general ledger, debiting cash and crediting an account for sales receivables. I then debited this account by creating dummy invoices for each sale by store to get a monthly total. �Balancing this receivables account against what was actually sold but not paid was very, very time-consuming because there were so many unknowns and variables. We were never sure inventory and profit were correct�or even close, yet the process used up at least four full days each month. Lead investigator Gangelhoff says, �We had to find a solution that was easy and fast at the registers, so it would enrich each customer�s shopping experience. Yet it had to give us sophisticated management tools so we could get fast-selling merchandise on shelves immediately. Kuhlman and Gangelhoff judged the reporting capabilities superior in the Microsoft solution. Microsoft Certified Partner Business Microvar Inc. (BMI) provided the winning software and enterprise solution. Founded in 1985, award-winning BMI specializes in enterprise solutions using Microsoft Great Plains, Microsoft Retail Management System, and Microsoft CRM. To ensure system usability, BMI�s five offices provide implementation consulting, training, development, and support. Scott Thelen, Account Executive at BMI, says that part of his team�s tasks were to provide tools to measure and improve Kuhlman�s most crucial metrics: inventory turnover and sell-through. Accordingly, BMI developed 10 specialized reports to help analyze those crucial barometers from different points of view, and another 10 for other company-specific tasks. Each site runs Microsoft Retail Management System Store Operations, the store-level solution that helps manage even very large stores. It can also help integrate single stores into an enterprise. Store Operations feeds data into Microsoft Retail Management System Headquarters, the enterprise-level retail solution whose reporting collects and presents data in store, regional, or enterprise formats. Headquarters� familiar spreadsheet format helps disseminate corporate updates, such as price changes, discount periods, between-store transfers, and new merchandise, down to individual stores, nationwide departments or categories, as well as store groups, regions, or the entire chain. Kuhlman says, �From the beginning, we�ve driven customers to KuhlmanCompany.com, our Web site. We collect complete data on each store�s customers and send out a weekly e-mail blast to over 30,000 opt-in addresses. We have an incredible percentage of these e-mails opened, which drives people to stores for special events, and to our site, which gets over 1.5 million hits per month.� Web orders are extracted from the Web site servers; purchased items are located using Microsoft Retail Management System, and then shipped from the appropriate store(s). Kuhlman reports, �Our farthest-reaching benefit is having accurate data, sliced the way we want it, at a moment�s notice. Very few retailers our size can do what we do. I expect the Microsoft solution will pay for itself in the first year. Just the staff hours it saves will do that. �We have tighter knowledge on where inventory is. We know what�s in the delivery queue, in the warehouse, in transit, and at what store. Everyone uses the system, from warehousing, to store staff, to corporate. Managers know what they have, what they can get, how fast, and from where. We see and solve problems and bottlenecks immediately. We better understand our purchasing and shrinkage, and we�re saving employee hours and steps in stores and at corporate headquarters too. By networking merchandise as one mass inventory, and customers as one large database�although both sets reside throughout the country�Kuhlman staff win sales and goodwill. Puegner says that end-of-day reports in stores now automatically include sales figures and inventory levels, which once required separate nightly counts. The process once took up to 30 minutes per store, and is now essentially a zero-time task. Each type of receivable�cash, Visa, MasterCard, Discover, AMEX�is set up in Microsoft Great Plains by store, eliminating Langdon�s previous receivable account with all the stores and receipt records, thus greatly speeding and simplifying her work. Executives and staff continue to find new ways Microsoft Retail Management System can add value. Puegner is looking into mobile point-of-sale devices for line-busting (speeding transactions) and physical inventories. Gangelhoff plans to integrate Microsoft Great Plains construction management features to streamline and economize building new stores. The test systems are now exercising new processes and routines for Kuhlman Company credit cards and gift cards. The CEO of Kuhlman is confident the system will grow and adapt to future needs. Puegner says, �If your retail chain isn�t well networked, you�re missing out on a lot of efficiencies. In retail, inefficiencies waste staff time and impact displaying the right goods at the right price. We see the future of our IT and accounting procedures and reporting getting better and better."